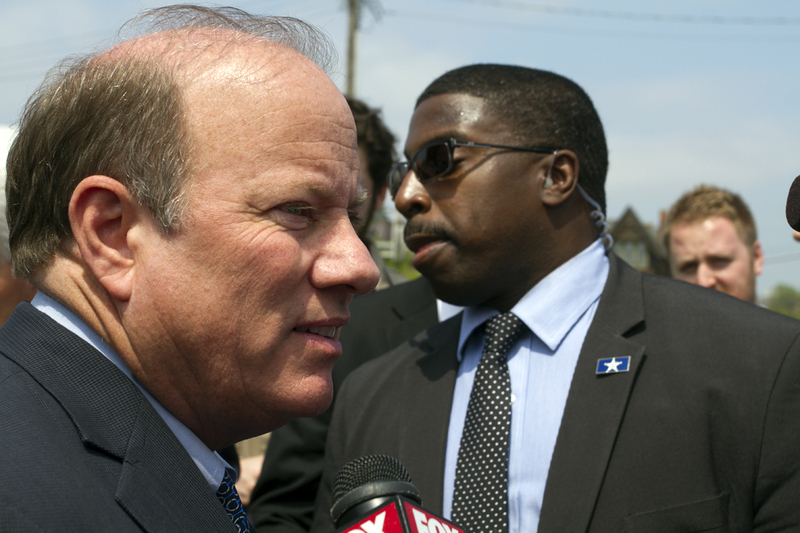 Detroit Mayor Mike Duggan. Photo by Steve Neavling. Detroit businessman Bob Carmack plans to dump more damaging information about Mayor Mike Duggan on Wednesday morning. The Detroit businessman, who hired a private investigator to follow Duggan after work, is the key witness in a bribery case against Councilman Gabe Leland, who is accused of trying to extort $15,000 from Carmack while he was wearing a wire for the FBI. The FBI also is investigating whether the mayor’s friend and key fundraiser, Dennis Archer Jr., also tried to extort Carmack. It’s unclear what information Carmack plans to release, but the mayor is clearly agitated. On Monday, Duggan held an unusual press conference and accused Carmack of making threats in hopes of gaining leverage in a handful of lawsuits filed against the city. In one suit, the mayor allegedly ordered the demolition of a building on a piece of property on Michigan Avenue that Carmack says he owned. Carmack, who called the mayor a “suburban gangster, said his motive behind releasing the information has nothing to do with the lawsuits. The idea, he said, is to show how the mayor uses his office to retaliate against foes and help his friends, most of whom are wealthy suburbanites who bankroll Duggan’s political machine. Duggan also is accused of going after towing companies in retaliation for filing lawsuits and to help his friend, Anthony Soave, who tows vehicles for the city and owns several impound lots. Soave told federal investigators he provided $300,000 worth of flights and a Rolex watch to then-Mayor Kwame Kilpatrick. The press conference is at 11 a.m. at Carmack’s business on Michigan Avenue.